Inbound Marketing: Get Found Using Google, Social Media, and Blogs is a comprehensive guide to increasing online visibility and engagement. Written by top marketing and startup bloggers, the book contains the latest information about customer behavior and preferred digital experiences. From the latest insights on lead nurturing and visual marketing to advice on producing remarkable content by building tools, readers will gain the information they need to transform their marketing online. The book also contains essential tools and resources that help build an effective marketing strategy, and tips for organizations of all sizes looking to build a reputation. When consumer behaviors change, marketing must change with them. Inbound Marketing: Get Found Using Google, Social Media, and Blogsis a complete guide to attracting, engaging, and delighting customers online. If you've been looking for a trustworthy primer on getting found online, here's a great place to start. Buy one for your clueless colleague too. Brian Halligan is CEO & Co-Founder of HubSpot, a marketing software company he co-founded eight years ago to help businesses transform the way they market their products. Since its founding, HubSpot has accumulated over 10,000 customers. He is a Senior Lecturer at MIT where he teaches 15.S16 Entrepreneurial Product Development and Marketing. He is author of two books: Marketing Lessons From the Grateful Dead and Inbound Marketing: Get Found Using Google, Social Media, and Blogs, which is in its seventh printing, has sold more than 50,000 copies, has been translated into nine languages, and peaked at #17 overall on the Amazon bestseller list. Brian was named an Ernst & Young Entrepreneur Of The Year 2011 New England award recipient. In his spare time, he sits on a few boards of directors, follows his beloved Red Sox, goes to the gym, and is learning to play guitar. Dharmesh is co-founder and CTO of HubSpot. HubSpot provides inbound marketing software that helps businesses attract, engage and delight customers on the web. The company, based in Cambridge, Massachusetts has over 10,000 customers and is a two-time member of the Inc. 500. HubSpot has raised over $100 million in venture capital. 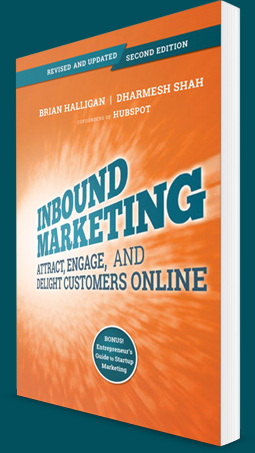 Dharmesh is the co-author of "Inbound Marketing: Get Found Using Google, Social Media and Blogs" published by Wiley. The book was a runaway hit and has been translated to 8 languages. He also authors OnStartups.com, a popular startup blog with over 350,000 members in its online community. He is an active member of the Boston area entrepreneurial community, an angel investor in over 40 startups, and a frequent speaker on the topic of startups and inbound marketing. Dharmesh holds a BS in Computer Science from UAB and an MS in the Management of Technology from MIT.